What would Roger have done? 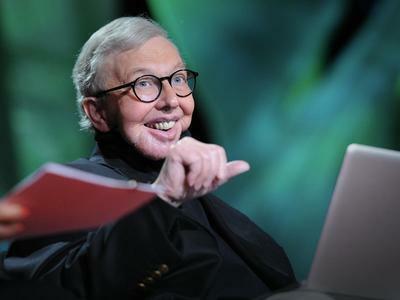 Roger Ebert was born on this day in 1942, and died a little over five years ago. I owe a good part of my success to reading and watching Roger, emulating as many of his lessons as I could, and later, being championed by him. Roger was a compassionate and thoughtful person who knew how powerful it could be to hear words of encouragement from someone you admire, particularly when you weren't expecting to hear them. I wrote about this in a piece titled, "The Most Important Thing Roger Taught Me," about a period of my life when I was down pretty deep in the abyss, and an unexpected email from Roger complimenting me and my work helped me climb out of it. "Roger wasn't responding to something I'd said in an earlier email or to a particular video essay I'd made or a particular piece I'd written," I wrote. "He was just thinking of me, and dashed off a note telling me that my existence meant something to him." But Roger was also inspirational for the way he dealt with hardship. He was diagnosed with cancer of the salivary glands in 2002 and lived with it for four years. In 2006, he had to have his jaw removed, which complicated his ability to eat and drink and left him dramatically disfigured. It also forced him to change the way he communicated with others. Most of us never have to deal with that sort of challenge, which can be immensely difficult to navigate even if you're not partly dependent on your physical voice to define your identity. That was the case with Roger, a Pulitzer prizewinning film critic who gained international fame as a broadcaster, somebody who was equally comfortable conversing and ad-libbing on camera and providing voice-over narration to documentaries, DVD supplements, and freestanding explanatory segments on the film review program he shared with Gene Siskel. The first time I ever met Roger was in late 1999 or early 2000, when he was searching for somebody to take over for Siskel, who had recently died of cancer. I was not on the list of possible co-hosts, nor did I expect to be; I was just a young Star-Ledger writer doing a profile of Roger during a difficult period of his career. We had dinner together in Manhattan, and I remember being mesmerized by that distinctive voice of his—the Midwest cadences; the affability with a hint of a prickly edge; the easygoing confidence with which the sentences tumbled out of him, each as fully formed as if he'd written them. Six years after that, Roger lost his physical voice to surgery. I've often thought about what I would've done if something like that happened to me. I don't know if I would have been able to summon the strength just to get through the days, let alone continue doing all of the things I was known for (as Roger did—at a high level of achievement and visibility) while simultaneously coming to grips with a drastic change in my physical self. I might've just crawled into a hole and stayed there for a few years, then maybe emerged at one-quarter strength. Or I might not have emerged at all. Who can say? Roger kept chugging along. There were interruptions here and there, periods of weeks or months where he could do little or nothing because he was in cancer treatment or recovering from it. There are a few gaps in his reviewing history; I'm still discovering titles here and there that he failed to review, and when I do the math and check a calendar, I usually realize, "Oh, right—that was a couple of months after his jaw was removed." But there were surprisingly few interruptions. And I never saw any major dips in quality. In fact, as I've said many times, I think Roger became a deeper, more introspective, more profoundly humanistic writer after he lost his physical voice. This was no small achievement considering how compassionate he was, and how good a writer he was, before his health started to decline. I don't want to make it sound as if I think endurance alone is any sort of primary virtue, because I don't. Everybody deals with trauma in their own way, and withdrawing and/or giving up is a legitimate response that shouldn't be harshly judged. Some people don't have the strength to keep going after physical losses as immense as the ones that Roger had to deal with, and that's no reflection on their character; it's often more a matter of how we're wired. Other people probably don't have the financial resources Roger had built up in the three decades prior to the loss of his physical voice. They might also lack the emotional support that Chaz, her extended family, and all of their friends were able to offer. Still, I do often look at Roger as an example of what's possible, even when things seem bleak. Roger didn't just soldier on. He treated trauma as an opportunity for creative as well as personal growth, then paid it all forward by cultivating or elevating the careers of other writers, many of whose bylines appear regularly here and on other sites. Often, when I'm confronted with a professional, emotional, or ethical quandary, I ask what the people I admire most would do. One of those people was, and remains, Roger. What would Roger have done here? I ask myself. Once I pose that question, the answer often becomes obvious. The answer also becomes obvious when the question has to do with how to go on living when somebody you love—or some part of your physical or emotional self—has died. What would Roger have done here? I ask myself. And the answer is: Roger would have kept going and tried to do the best work he could under the circumstances, while reminding himself that other people's lives meant as much as his, and that it's important to try to help others even when you're asking for help. And he would try to remember that matter how much work you've already done on yourself, there's still a better you inside, and you should never stop trying to dig it out and show it to the world.